Modern Assyrians are descendants of ancient Assyrians, who once held one of the largest, most powerful, and longest-lived empires. They are a constantly persecuted minority in the Middle East because of their Assyrian identity and Christian faith and many have been forced out of their ancestral homelands into Diaspora. Assyrians are in critical danger of total assimilation and extinction. Assyrian – The Struggle For Identity is a historically significant documentary movie because it is unprecedented in its intellectual and artistic approaches. Each of these approaches will be discussed individually in order to understand their creative importance to each other and to the project. Keeping in mind the equal importance of these creative aspects, it is practical to discuss the intellectual approach first. The intellectual approach is to present Assyrian history, culture and politics simultaneously without causing confusion. There are two types of methodological approaches to understanding the history of Assyrians: there’s positivism (which is the traditional fact-based) approach and there is the theoretical approach. Positivism entails using misconceptions about ancient history that developed prior to 19th century excavations from previously biased sources like the Old Testament Bible and ancient Greek historians. 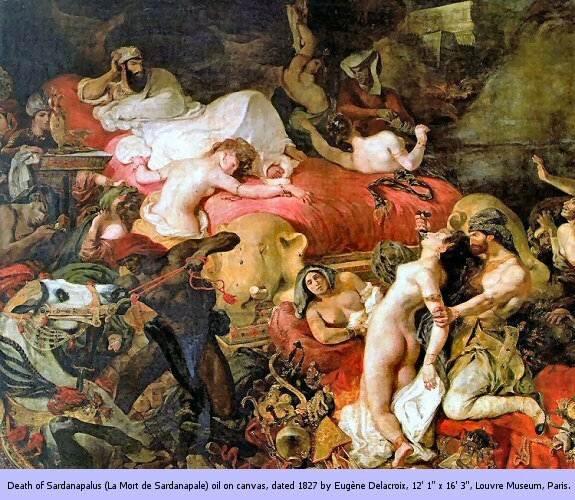 In Zainab Bahrani’s Women of Babylon, for example, evidence of these misconceptions is presented: Eugene Delacroix’s Death of Sardanapalus (See Figure 1). This painting was completed about a decade before 19th century excavations in Mesopotamia, portraying women as sexual devices and portraying Sardanapalus, which is the Greek name equivalent of Sannacherib, as a monarch who lived in great luxury as he casually watched the destruction of the Assyrian empire. Both the portrayal of women and the portrayal of King Sannacherib are false and ancient Mesopotamian texts confirm this! Hence, a theoretical approach is the best approach for the historical aspect of the movie because it does not rely on these misconceptions. Assyrian culture involves religion, language, music, food, traditions, and art and is what separates Assyrians from other peoples in the world. The Assyrian Identity movie focuses on religion and language with an informative explanation of the others. The ancient Assyrian religion of Ashurism would best be explained by some of the top Assyriologists and the modern Assyrian religion of Christianity would best be explained by Church clergy (i.e. Syriac Orthodox, Syriac Catholic, Church of the East, Chaldean Catholic and Protestant). Edward Odisho introduces, in his article Bilingualism, an interesting graph for understanding the Assyrian language shifts (See Figure 2). This graph can represent the language shift between the ancient Assyrian language of Akkadian (L1) and modern Assyrian-Aramaic (L2). What must be understood is that languages take hundreds of years for this shift to occur. Even then the modern language has elements of the previous language, as is the case with Akkadian and Assyrian-Aramaic. 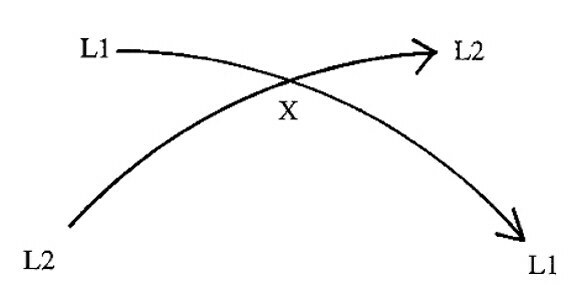 The Language Shift graph can also represent the language shift between Assyrian-Aramaic (L1) and Arabic (L2). Hopefully, with the recent implementation of Assyrian schools in the Assyrian homelands, this shift will reverse. Assyrian politics is where things get messy and that is why this beast must be treated as an entity separate from Assyrian history even though they are closely related. This is because politics have been denied of Assyrians in their homelands, especially in recent history. Wilfred Bet-Alkhas, editor of Zinda Magazine, said it best in his editorial Neo-Assyrianism: “Our Moslem neighbors are quite aware of our internal struggles and prefer that we use a name other than “Assyrian”. They view this issue differently and more broadly. Because to a politically savvy person, the term Assyrian implies one thing only – a claim to a territory.” One tactic used to deny Assyrian political status and their claim to territory was to deny and confuse Assyrians of their ethnic identity through a forced process known as Arabization. In his book Assyrians: A Continuous Saga, Fred Aprim tells of how Iraqi author Ahmed Sousa tried to do just that by exclaiming Assyrians, Babylonians, and Sumerians as the descendants of Arabs in history books that became standardized in the Iraqi education system. The theoretical approach to Assyrian history, the emphasis on the cultural aspects of language and religion, and the separation of politics sums up the intellectual approach of the documentary. This is a great intellectual approach, but how does one breach 2600 years of history, from the Fall of Nineveh to present day, and still not bore the audience? The intellectual approach must be visually reinforced! No viewer is going to want to try understanding Odisho’s Language Shift graph among others if it looks like its current state. No viewer is going to want to listen to a bunch of heads talking for two hours about something they possibly know little or nothing about either. This is mainly because an American audience, specifically the younger generation, is visually oriented. So there is need to create exciting visuals, meaning a lot of graphics and animation. Creating the movie site a while before the movie’s release has allowed a basis for this: www.assyriandoc.com. The movie site gives a very distinct, exciting production look and feel that is to be infused in each aspect of the production, from the visuals to the sounds. The injustices wrought upon Assyrians needs to be known to the world and so does their nearly 7,000 years of misunderstood history. The intellectual approach, which includes Assyrian history, culture and politics as well as reinforcing this approach with an exciting artistic approach, make the Assyrian Identity movie an unwritten history book whose impact will certainly be powerful! Aprim, Fred. Assyrians: A Continuous Saga. Philadelphia: Xlibris Corporation, 2004. Bahrani, Zainab. Women of Babylon. London: Routledge, 2001. Bet-Alkhas, Wilfred. “Neo-Assyrianism & the End of the Confounded Identity.” Zinda Magazine. 7 August 2006, Volume XII, Issue 16. <https://www.zindamagazine.com/html/archives/2006/08.07.06/index_sat.php>. Odisho, Edward. “Bilingualism: A Salient Feature And Dynamic Feature of Ancient Civilizations.” Mediterranean Language Review. 14 (2002): 71-97.